We have incorporated modern technology in almost every factor of our life – from cell phones to kitchen to lifestyle. Into our architecture inspiration series, today we’re featuring some of the best digitally-inspired modern living room furniture that is created specifically with the “digital natives” who were born connected and for those who have embraced digital connectivity fully. 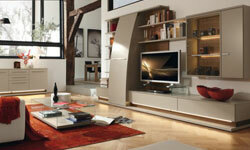 We hope that you will definitely enjoy this showcase of modern style living room designs. Enjoy! really inspiring. they are amazing. thanks for sharing.